Does the News Industry Deserve a Bailout? 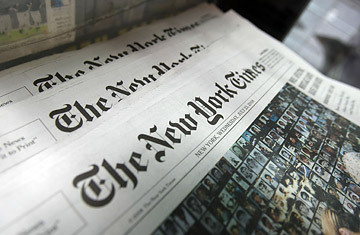 Copies of the New York Times are seen for sale in New York City. One of the oldest newspaper chains, Journal Register, went bankrupt late last week. It had too much debt and too little operating income. The daily newspapers in Philadelphia have also filed for Chapter 11. There have been rumors, almost certainly untrue, that The New York Times (NYT) will run low on funds to pay its debt. In the case of The Times it has valuable assets to sell, but its situation deteriorates each quarter. By most estimates, its second largest property, The Boston Globe, loses $1 million a week. The federal government is handing out over $1.5 trillion to support the economy through the Obama stimulus package, TARP, and the new mortgage assistance program. Among the clear winners in the frenzy to save parts of American industry are financial firms and the car companies. Aid may be extended to auto parts companies and insurance operators. The general rule of thumb is that the sectors of the economy that are considered "strategic" will get the lion's share of funding. Car companies are strategic because they employ so many people. Banks are in this category because the credit system cannot operate efficiently without them. Since it is almost certain that a large portion of the print news industry will be damaged by the recession and the internet, why is it being bypassed as a bailout candidate? The easy answer is that news will be available on the internet. But, since readers are less likely to be loyal to brands when reading news online than they are with print, that answer does not address the problem. Online newspapers face more competition on the internet than they do as physical products. The argument that economists would make for the appropriateness of the downfall of print is based on "creative destruction." As one generation of products or services become obsolete it is replaced by another which better fits the current environment. The car industry and the banks in their current incarnations look like they will dodge any application of this principle in the real world. The case has not been made, and it should be, that the strategic value of the print media comes from the centuries that it has served as a check and balance to the central government both in the United States and elsewhere. The most obvious example of this is the reporting on Watergate done by The Washington Post, but the tradition is longer and deeper than many people remember. William Randolph Hearst may have been one of the most reprehensible publishers in history, but he was instrumental in building a level of public opinion that prevented FDR's plans for The New Deal from usurping the power that appropriately belonged to Congress and the courts. If it had not been for the press, Huey Long might have turned Louisiana into its own nation state. Politicians have every reason to want to see print media fail. That can be said tongue in cheek, but too many governors and congressmen have lost jobs after newspaper investigations to make the relationship between Fourth Estate and politicians a comfortable one. A neutered press would benefit a number of elected officials. That may be reason enough for them to stay away from providing newspaper and magazines with financial aid. The other obvious reason the government may be against putting capital into media companies is that it could give the appearance of politicians "buying" better treatment by the press. Since Senators have been known to find themselves in compromising conditions, getting a favor from the newspapers now and then might be helpful. Drawing a line between the "state" of the government and the "church" of the press might be impossible. The coroner's report on the newspaper and magazine industries will read that they died from lack of public interest in the printed word. What should not be left unsaid is that its service to the republic was extraordinary and because of that, it deserved better. Read a TIME cover story on how to save the newspaper.